Can My Computer Be Hacked If It's Turned Off? - Ask Leo! It’s a very unlikely scenario that could allow a turned-off computer to be hacked. I’ll describe it and show you how to prevent it. Your PC is off; it’s not doing anything. Unless you’ve taken extra steps described below, the PC will not be able to be restarted and hacked from outside if it’s turned off, even if you leave it connected to the internet and to power. It’s not uncommon for a laptop to be placed into standby mode only to wake up on its own a while later. The exact reasons this happens vary — I can’t give you a simple explanation. There is a simple work around, though: if you find your laptop waking up on its own, and that concerns you, don’t use standby. If it works for you, that’s great, but I generally avoid standby for a variety of reasons, including this one. A lot of things have to line up for it to happen. You have to have this remote power-on ability (Wake on LAN) turned on in the network settings, and most computers do not. In most cases, it’s a setting in the UEFI or BIOS you have to turn on yourself. If you haven’t turned it on, then it’s probably not on. The PC also has to be fundamentally insecure. In other words, it has to be vulnerable to be being hacked when it’s running. That’s something you can control by putting appropriate security measures into place. So, as I said, it’s possible. « Previous post: Why is My System Slow If the CPU Is Mostly Idle? I remember once reading a webcomic somewhere. In the first panel it showed the “Hollywood version” in which this guy tries to stop the hacker from accessing the root account but then it doesn’t work. Then the second panel had the “reality” version which was just the guy unplugging the computer from the socket. It was pretty funny. Unfortunately I dont remember where I saw it. An interesting article, as usual. 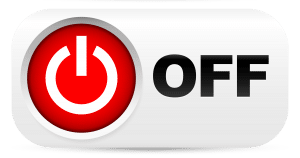 Is your pc less vlulnerable to hackers/malware than it would be othgerwise, if you click on “go offline” before putting it on standby? Not really. “Go Offline” really only impacts the browser and perhaps the mail program, not networking as a whole. #Tom R: Many thanks for your explanation. All you need is an axe and you can hack any computer, whether it’s on or off. Thanks for the explanation Leo. In my case it does in fact shut off both the browser and the mail program.